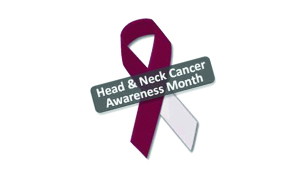 Today we are going to look at a diverse group of cancers of the head and neck region. This type of cancer as a group comprises about 4% of all cancers worldwide. The most common histological type arises from the skin or mucosal surface and is called squamous cell carcinoma. The organs that could be affected are the eyes, lips, mouth, sinuses, nose, throat, larynx (voice box), ear, thyroid and salivary glands. Usually they present with a lump or ulcer that doesn’t go away or heal, sore throat, pain or difficulties in swallowing, voice changes. Some times the lump may be in the neck region with no other symptoms. If a tumour is in the airway the patient may have trouble breathing. The biggest risk factors of head and neck cancers are alcohol and tobacco. Of note even smokeless tobacco (chewing and snuff) increases the risk of cancer. According to long established research 75 % of these cancers are attributed to these risk factorsand the risk is even higher for those who use both. Certain regions of the head and neck are prone to chronic infections, which lead to the development of cancer. This includes Human Papilloma Virus thatinvolves the tonsils, base of tongue and throat at the level of the back of the mouth. For us here in Zambia conjuctival cancers are quite common and HPV is said to be a majorcause. Epstein Barr Virus has been implicated for nasopharyngeal and salivary gland cancers. Consumption of betel quid, preserved and salted foods also increase the risk of oral cancers. Poor oral hygiene and missing teeth are a weak but present risk factor. Screening and early detection guidelines for head and neck cancers have not yet been established or proven to improve survival. However, it may be prudent to get a physical check up yearly. Ideally everyone must get a dental check every 6- 12 months and this may be a good opportunity for screening. This is especially important in those with high risklifestyle habits such as smoking and alcohol intake. Treatment of head and neck cancers is mostly surgery with the exception of nasopharyngeal cancers where radiation therapy takes precedence. For stage II and above addition of chemotherapy to radiation therapy has been shown to be beneficial for most of the cancer types. The chemotherapy serves two purposes. The first is to increase the strength of the radiotherapy. The second is to mop up any micro spread of cancer cells. In the recent past targeted agents are being increasingly employed in radiosensitisation. The side effects of treatment can be quite extensive whether it is surgery or radiation. Surgery of very advanced cancers often leaves a defect. A good reconstructive surgery service can allow patients to return to almost normal life after cure by providing prosthesis in the defective areas. Sometimes, as is the case with conjuctival cancers, the eye is removed and the patient loses function of that organ. Radiation therapy can cause acute and chronic side effects. Acute side effects are those observed during treatment up to three months after treatment. Usually the onset is fourteen days into treatment as the new layers of mucosa and skin appear. Common symptoms are pain, difficulties in swallowing and mucosal ulcers. Nutritional support in this period is very important and observation of appropriate diet plus hygiene is necessary. For example spicy, extremely hot and rough foods must be avoided. A soft toothbrush should be used to avoid mechanical injury. The skin in the radiated area should not be washed with soap or have any lotion applied to it before treatment. Shaving is also prohibited during the period of radiation. An important note in patients before receiving head and neck radiotherapy is to undergo a dental check up. All rotten and unhealthy teeth must be taken out or treated with fluoride. The taste in the mouth also changes. Chronic side effects occur after three months. The most common one is a condition called Xerostomia or dry mouth. The salivary glands are usually in the area receiving radiation therapy. The doses needed to cure the cancer may cause salivary glands to stop working. My patients have often told me that it is only when you lose a function of such an organ do you realise saliva is vital. Saliva is a very important fluid that is produced in 3 major glands and numerous minor ones found in oral cavity. The consistency and function of each group is peculiar contributing to viscosity and consistency. Of course as we know the enzymes that digest carbohydrates are also found in saliva. Using artificial substitutes and drinking a lot of fluids can replace saliva. Loss of muscle and skin elasticity is another significant late toxicity. This limits the range of motion of the head. In some cases of advanced hypopharyngeal and laryngeal cancer complete obstruction of the airway can occur. This forces doctors to create a different air passage by creating a tracheostomy. A tracheostomy a hole in the throat to the trachea made by a doctor.A tube is then inserted to help the patient breathe. Tracheostomies can be temporal or permanent depending on the indication. Many patients learn how to live and clean the tracheostomies without any help from a second person. When the voice box is removed some patients learn how to talk very well by putting the finger over their tracheostomies. As mentioned previously patients with head and neck cancers need nutritional support. High calorie diets assist in maintaining weight. In extreme cases of inabitity to eat a feeding tube can be passed either through the nose called a nasogastric tube (NGT) or a direct tube to the stomach (gastrostoma) or small intestine (jejunostoma). Care must be taken of the skin around the outlet to avoid burns and ulcers from internal fluid. Patients who survive head and neck cancers face a lot of challenges and it is important that we support them. The author is a Clinical and Radiation Oncologist. 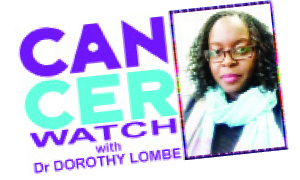 She is the founder of Oncocurae Consultancy an organisation dedicated to conquering cancer in the continuum of care. Email: dorothylombe@yahoo.com.